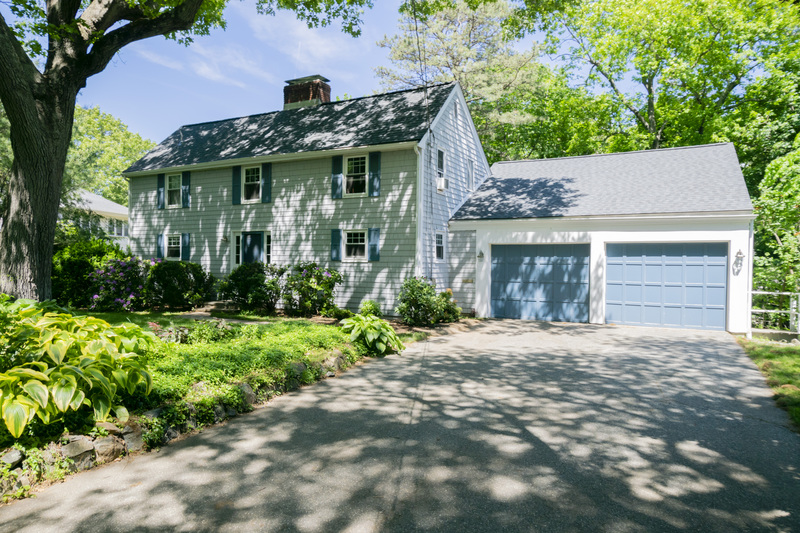 Imagine living in one of Lexington’s most desirable neighborhoods, Follen Hill, perfectly set on a quiet street within short walking distance to the Minuteman Bike Path, public transportation, and the popular Wilson’s Farm. Welcome home to this meticulously-maintained Colonial offering the perfect blend of classic charm with its stately, traditional exterior and its freshly painted interior full of contemporary style. Perennial plantings accent the front gardens, including hearty hostas, rhododendron trees, and shasta daisies, all awaiting the arrival of warm weather. Gleaming, newly-refinished hardwood floors and a neutral color palette span the home’s easy-flow floor plan. Prepare to be amazed as the front foyer, with slate floor tiles, unfolds into the spacious, open concept living and dining rooms. Natural light streams through the large picture window and skylights of the double-height formal living room. A dramatic cathedral ceiling creates a feeling of added expansiveness stretching to the open, second-level balcony above. A wood burning fireplace, with a floor to ceiling brick surround, creates a focal point for this beautiful room. Built-in shelving to the right of the fireplace offers the perfect spot to display treasured collectibles and a seamless transition opens to the formal dining room perfect for effortless entertaining. Dash over to nearby Wilson’s Farm for fresh produce and return home to create culinary delights in the bright and cheerful kitchen with granite counters, modern cabinetry, brushed nickel hardware, a tile backsplash, ceramic floor tiles, recessed lighting, an informal dining area, and a built-in microwave newly installed in 2018. A sunny window over the sink opens the home to even more light while offering delightful views of the front landscape and perennial gardens. A door from the kitchen offers easy access to the home’s two-car garage perfect for managing an active lifestyle. The garage is oversized with plenty of space for parking and storage. The garage also offers an expanded workshop area or space for additional storage with a rear door conveniently connecting to the deck and backyard beyond. Escape to the first level, private master suite retreat with gleaming, newly refinished hardwood floors. Relax in comfort and style as natural light streams through the large bay window. The bedroom opens to a dressing room with two double closets for the ultimate storage and organization. The master bathroom offers an over-sized shower and tiled floor. A staircase from the front foyer leads you to three family bedrooms and the family bathroom on the second level. A large landing at the top of the stairs has gleaming hardwood floors and offers a great sitting area perfect for curling up with a good book. The landing opens to the first level below as sunlight streams through the skylights. The family bedrooms are light-filled and neutrally painted with shining, newly-refinished hardwood floors. One of the bedrooms offers a large walk-in closet, built-in shelving, and a skylight. The full family bathroom is tastefully done in neutral tones with a large linen closet and tub with shower. Plenty more space awaits on the finished lower level with a large room featuring the home’s second wood-burning fireplace, perfect for use as a family room, playroom, exercise space, or whatever you may desire. A sliding glass door provides another great connection to the outdoors with direct access to the backyard. Another full bathroom on the lower level is fresh and inviting with a shower. A spacious and efficient laundry room with utility sink is located on the lower level in addition to abundant space for storage. Connect with the outdoors via the sliding glass door from the living room to the spacious deck where many summer days will be spent relaxing and entertaining while overlooking the private backyard. A glass-paneled door from the dining room opens to the screened porch, which also offers an exterior door for additional access to the deck. The backyard offers abundant privacy throughout most of the year as the mature trees graciously bloom, surrounding the yard in a tranquil oasis. The perennials, including ivy and periwinkle, accent the backyard for low-maintenance landscaping. Outdoor living is easy during rain or shine with the screened porch designed for endless nature views.